We consider the problem of splitting an image into a small number of convex polygons with vertices at subpixel resolution. Edges of resulting superpixels can have any direction and should adhere well to object boundaries. We introduce a Convex Constrained Mesh that accepts any straight line segments (or a straight-line graph based on a topological persistence) and outputs a complete mesh of convex polygons without small angles and with approximation guarantees for the given lines. This work (joint with Jeremy Forsythe) is published in Journal of Electronic Imaging, 26(6), 061609, 2017. Dr Vitaliy Kurlin is a mathematician by training and has completed the PhD in Geometry and Topology at Moscow State University in 2003. 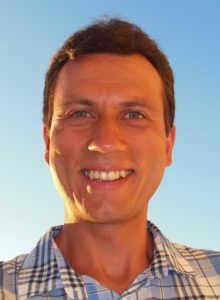 He was awarded the Marie Curie International Incoming Fellowship (2005-2007) and the EPSRC grant “Persistent Topological Structures in Noisy Images” (2011-2013). In 2014-2016 he has gained industrial experience through Knowledge Transfer Secondments in the Computer Vision group at Microsoft Research, Cambridge, United Kingdom. From 2018, Dr Vitaliy Kurlin leads the Liverpool team on the £2.8M 5-year EPSRC project “Application-Driven Topological Data Analysis” (with Universities of Oxford and Swansea). He works as a Data Scientist in the new £68M Materials Innovation Factory at the University of Liverpool, where his role is to facilitate the collaboration between Chemists and Computer Scientists. His research group includes 1 postdoc and 5 PhD students working on applications topology and geometry to Materials Science, Computer Vision and Climate. You can visit Dr Kurlin’s website here.